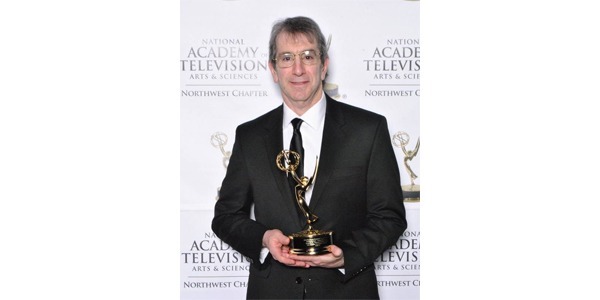 Congratulations to UW Bioengineering’s Eric Chudler and his team at the University of Washington on winning a 2017 Northwest Regional Emmy Award for the program, “BrainWorks: Exercise and the Brain.” Winners were announced June 3 at the Emmy® Awards Presentation at Fremont Studios in Seattle. The UWTV program, developed and hosted by Dr. Chudler, research associate professor, won in the Science and Health – Program/Special category. The winning episode discusses the benefits of exercise on the brain and learning, and is part of the BrainWorks series, which takes viewers on a journey inside the human brain, and aims to educate children about the wonders of neuroscience. Dr. Chudler was executive producer for the episode, along with Cara Podenski, co-executive producer, and Lionel Flynn, director. Watch the winning episode below!